Top Dentist Orlando has! We specialize in dental implants, invisalign, family dentistry, cosmetic dentistry. Paradise Dental of Orlando, FL - Premier Cosmetic Dentist in Orlando. Orlando Residents Get Top Notch Service for Dental Implants, Invisalign, Cosmetic Dentistry, Teeth Whitening Porcelain Crown. Please contact us today to schedule an appointment! Russell Hamarnah, DMD offer comprehensive Orlando dentistry services for the entire family. 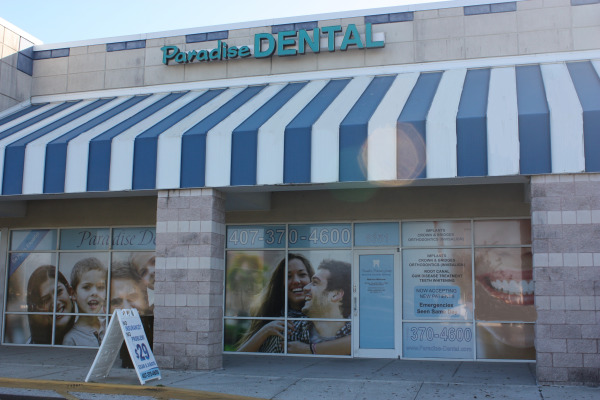 Paradise Dental of Orlando has been an area dental office for over 30 years. Dr. Hamarnah has been practicing for over 10 years. He has been carrying its legacy while adding his own personal touch and pain-free dentistry philosophy to the mix. Dr. Hamarnah graduated at the top of his class and came highly recommended by his professors. He is actively involved as an alumni and is a member of the American Dental Association, West Coast Dental Association, and Polk West Coast Dental Association. At Paradise Dental our main concern is all about the patient experience. Your comfort is of utmost importance. We believe that dental patients deserve gentle dental care and that pain is unnecessary. Whether you're undergoing a simple exam and cleaning or a complex procedure, we monitor your comfort level and makes sure that you are completely at ease.Paradise Dental of Orlando offers oral conscious sedation to patients with dental anxiety and to those whose procedures warrant sedation. Oral conscious sedation involves taking a pill which sedates you and blocks pain while keeping you conscious. Because oral conscious sedation is pain-free, we can perform most dental work in a single visit. Not only is this more comfortable for you, it's also more convenient as you will not need to take as many extra days off from work or come back to our Orlando dental office numerous times to complete the treatment. Dr. Hamarnah cares for the entire family and offers a comprehensive list of dental services that include: family dentistry, general dentistry, exams and cleanings, cosmetic dentistry, veneers, dental implants, dentures, and teeth whitening. Please browse through our website and be sure to contact us if you have any questions or would like to schedule an appointment. You may also use our online appointment request form to schedule your appointment with our gentle Orlando dentist. Do you have an appointment scheduled? Orlando dentist, Dr. Russell Hamarnah is dedicated to general, family, and cosmetic dentistry with services including dental exams, dental makeovers, teeth whitening, veneers, crowns, x-rays, cleanings, and more. Please call our dentist in Orlando, FL to schedule your next appointment.